Should You Advertise on Yelp? The social media business review website Yelp reported that its revenue grew by 67% last quarter as it aggressively pushes its advertising and co-branding strategies. Many of my clients are getting emails and phone calls from Yelp suggesting that they jump on board the Yelp advertising bandwagon. The come-ons suggest both straight-forward advertising campaigns and they suggest that the businesses offer special Yelp deals for customers that check-in at the business using a mobile device. “Should I advertise with Yelp?” is a frequent question I get asked. Yelp is read by a lot of people searching for restaurants and services. One of my professional services clients gets at least a phone call a week from a prospective client who says that they found them on Yelp. Yelp is expensive. Its monthly packages run from $300 to $1000 or more. Since Yelp ads drive people to your business’ Yelp page, it makes sense to advertise only if you already have a good number of positive reviews. There is no point in sending people to your Yelp page if there are no glowing reports of what you do. Moreover, most of my clients offer professional services which do not lead to social media tie ins. So, I recommend that my clients buy the traditional Yelp ads and steer clear of the Yelp deals and other specials that are designed to grab attention in smart phone apps. I struggle to think of what a CPA firm can offer to snag impulse buyers looking at their phones as they walk by the firm’s office. Similarly, I cannot suggest a special that a criminal defense attorney can offer someone who checks in at their office on a iPhone. Yes, Yelp is a good, aggressive business. If your customers love you and have already Yelped their happiness, drawing attention to your happy clients will attract new ones. Should you advertise with Yelp? Look at your current Yelp page. What’s there will tell you if a Yelp advertising campaign makes sense. When I look at a Groupon deal I assume that the deal-making company has been vetted by Groupon. I expect that Groupon has made sure that the company is real and is sufficiently big to handle the traffic that the deal will bring them. As a consumer I took comfort in believing that Groupon knew its deal makers were quality companies. After all, Groupon was standing in front of a company, and their reputation was at stake. I have bought 10’s of Groupons and have had no problems. I felt that any Groupon I bought would lead me to a quality company whose products and service I could safely sample at a reduced cost. I have learned better. Buyer beware! Bin32 is a Napa wine seller who offered a Groupon for $198 of wine for only $54. Great! Except that in February when I went online, selected my wines, and went to check-out, the Groupon did not cover the full amount of the charge. In addition to shipping, which was an acceptable extra, in my opinion, there $4.54 was not covered. I gave the site my credit card to get the order placed, and decided to complain to Groupon separately. Groupon emailed me back after a day or so that Bin 32 reported that they charged the extra amount for ” … for all taxes and processing fees.” Of course, $4.54 is not a tax amount or anything that maths out. It was just Bin 32 trying to get more money. After I complained again, Groupon gave me a $10 credit for my inconvenience. I was more than made whole, so I was happy. Except the wine never arrived. After about a month I checked the Bin 32 site and saw that my order status was “Processing”. I sent Bin 32 email inquiries (I could not find a phone number on their web site) in March and then again in April. Nothing. When I checked a couple days ago — we’re now in May — my order on the Bin 32 site was listed as “Complete” and there was a note that the order had shipped by UPS. Except, of course, I hadn’t received any wine. I contacted Groupon yesterday, and today I received a full credit for what I paid Groupon. I am still out about $13 that was charged to my AMX, but after the earlier $10 Groupon credit, I am only really in the hole for $3 and change. First the positive. Groupon has been responsive and wonderful. But, Groupon doesn’t do a flawless job of researching its dealers. Bin 32 has 78 ratings on Yelp. All of them are 1-star. Some of the Yelpers complain that in addition to not delivering the goods, BIN32 kept charging their debit and credit cards for orders not placed. Yelp’s deals include links to the business’ ratings page on their site. That’s handy. In the future, I am going to be more careful when buying a Groupon and do some research before clicking “Buy”. If you’re a Yelper and write a review for a businesses you patronized, you expect that your comments are going to show up on the business’ page and affect the star-ratings. Maybe they will, but maybe they won’t. While I was researching the Yelp filtering of reviews for an auto repair shop I started looking at the profiles of people whose positive comments were not appearing on the business’ page. The list of reviews and the count of reviews on the people’s profile pages showed the filtered reviews. There was no indication when looking at the person’s page that Yelp distrusted their comments. In some cases, the profile pages showed that the person had written several reviews, and they looked like a valued Yelper. But, when you clicked on any of the person’s reviews to the business’ page, the reviews were not there. Yelp had filtered all of that person’s comments. If you were the Yelper, you’d have no clue that whatever you were writing on Yelp was not being seen by the community. Your profile page shows that you’ve posted 9 or 35 Yelps. The only way you can check to see if Yelp is displaying your carefully crafted reviews is if you click through on each review on your profile page to see if it is also showing up on the business’ page. That’s time consuming, and there’s nothing you can do about being filtered anyway. My own Yelp profile shows that I have 29 Yelp friends and have written 133 reviews. But, at least one of those reviews doesn’t show up for the business. I rated a real experience I’d had, but somehow the review isn’t showing up. I don’t know why, and there seems to be no way for me to tell Yelp that their filtering system screwed up. That’s the point in my earlier post, too. Yelp’s filtering system has flaws, and it doesn’t allow feedback. There’s no mechanism for the Yelp programmers to learn from their mistakes or for reviewers to learn what Yelp thinks they are doing wrong. Yelp, please open up your filtering process, let us communicate with the Goddess of Reviews, and let legitimate Yelpers participate in improving the site. Are Your Business’ Happy Yelps Being Muzzled? This month I received a phone call from an automobile repair shop owner whose business is taking a beating because of its bad showing on Yelp. There are 7 reviews for his shop online, and 6 of them gave the service 1 star. The owner told me that awhile ago he was approached by Yelp to buy ads on the site. At that time he had a lot of positive reviews. He said that after he declined to advertize, he noticed that his positive reviews started disappearing from the site. They were being removed by Yelp’s filter. Yelp lets you see the reviews it has removed from active rankings. When I checked, the repair place had 22 filtered reviews, and those had an average rating of 4.22 stars. I noticed that many of the five-star reviews might be suspicious because they’re from people without profile photographs and from people who had written one review on Yelp, the filtered one for the auto shop. Many of the filtered reviews were from reviewers whose other reviews are also being filtered by Yelp. I checked their profiles and clicked on the links to their reviews to see if those reviews showed up. It looked like that Yelp — for some reason — distrusted everything that these people wrote. On the other hand, some of the filtered reviews came from people whose comments on other businesses are being displayed, and one of the visible one-star reviews was written by a person without a profile photo who had only reviewed this business. In addition, when I read the positive reviews, there was no obvious pattern in what was said or the length of the review. None of the 5-star raves sounded fake to my human ear. 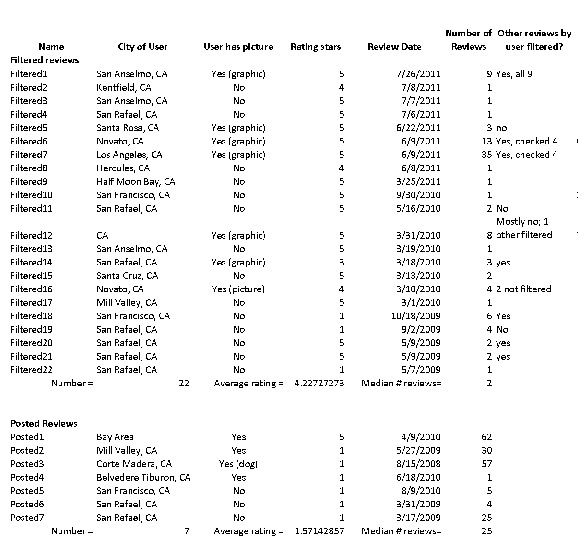 So, why has Yelp decided to show 7 reviews averaging 1.57 stars instead of displaying all 29 with an average of 3.58 stars? Is it revenge against a non-advertiser? I understand why Yelp wants to show only real-person penned, non-financially-motivated reviews. We all want to know that the rave we are reading is an honest report from a customer and that it was not written by friends, relatives, or the owner himself. Still, Yelp’s software seems — at best — arbitrary. Its decisions don’t conform to obvious logic, and many — if not most or ALL — of the filtered reviews sure sound like they’re legitimate. Worse, there is no obvious way to contact Yelp for support. I could not locate a phone number to call or appeal process for the business owner to follow. So, the business owner has to live with a rant-filled 1.5 online profile that kills his business. I’ve heard Len Tillum, a lawyer with a radio show on KGO, tell anguished business owners that there’s nothing they can do legally about perceived unfair filtering on Yelp. He’s said that a web site owner, like Yelp, can decide what content they want on their site for whatever reason. However, for those of us to rely on Yelp and Yelp ourselves, more transparency would be appreciated. I want to know that the 1-star business is truly a place I should avoid and not that its owner just decided he couldn’t afford to advertize at Yelp. Do you see a pattern in the filtering that I’ve missed? Let me know your insights by posting here or email me (if you email, please answer the spam challenge! ).